SAN DIEGO, CA (11/26/12) For decades, the battle has raged: Beatles or Stones? Through their heyday, fans accused London’s Rolling Stones of stealing ideas — even entire albums – from their Liverpool counterparts. At the same time, the Beatles secretly envied the Stones’ “bad boy” image and attitude, often copying their style. Both bands are unmistakably great, scoring an array of hits that changed musical history, but only one can be the best. The most infamous rivalry in rock and roll never played out in a public arena until now as Beatles vs. Stones – A Musical Shoot Out performs Wednesday, December 26 at Anthology in San Diego. Were the Stones yelling for “Help” to fight the songwriting prowess of Lennon/McCartney? Or were the Beatles crying “Gimme Shelter” from the relentless sonic barrage of Jagger/Richards classics? The epic duel between two rock giants as both groups demand the ultimate satisfaction from an estimated 1,800 attendees at the concert. Would you let your daughter marry a Rolling Stone, or your son come home with a Beatle haircut? This ultimate battle of the bands pits the mop tops against the bad boys. London against Liverpool. Guitars will weep and dice will tumble, and in the end, when the whip comes down, only one band shall emerge victorious. Whoever wins, the audience is sure to be dazzled by an “electrifying show” (O.C Register), with fantastic music, iconic wardrobe and spot on performances down to the onstage banter, missed notes and flubs heard on the original records. Members of both Abbey Road and Jumping Jack Flash have taken great care to recreate the experience of seeing these incredible bands live so as to please casual fans and purists alike. That ‘All You Need is Love’ spirit appears to be lost on Messrs. Hutchison and Clarke, who continue trading barbs. “The Beatles wrote Let It Be, but the Stones countered with Let It Bleed!” snarls Young. “Listen, mate,” counters Axel. “The song John and Paul gave to the Stones (‘I Wanna Be Your Man’ in 1963) was one they let Ringo sing…that says it all!” Ouch. Beatles or Stones? You decide! 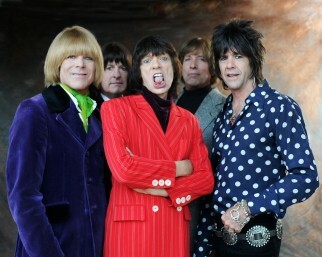 “If you missed The Beatles and The Rolling Stones live, here is your second chance,” – San Clemente Times.